Bionicle debuted in 2001, and right out of the gate it exploded onto the scene with crazy creatures sporting interesting colors. For example 8548 Nui-Jaga featured two scorpion like creatures and all the sets with Rahi (a term used for any creature or animal in Bionicle's lore) featured two identical or very similar builds, to duel and compete with a friend with. One such set sported a Bright Violet [TLG]/ Purple[BL] Rahi and the other Medium Blue, while 8549 Tarakava featured Bright Bluish Green [TLG]/ Dark Turquoise [BL], also known as Teal – a freshly resurrected color! 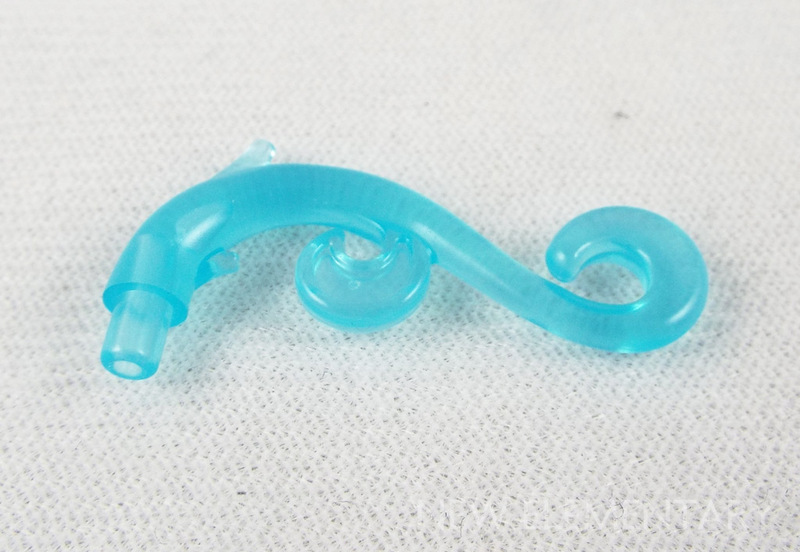 Everyone's excited to see the return of Teal, but Bionicle fans especially hold it dear in their hearts since it was one of the rarer colors for Constraction fans, which made it more of a challenge to work with. 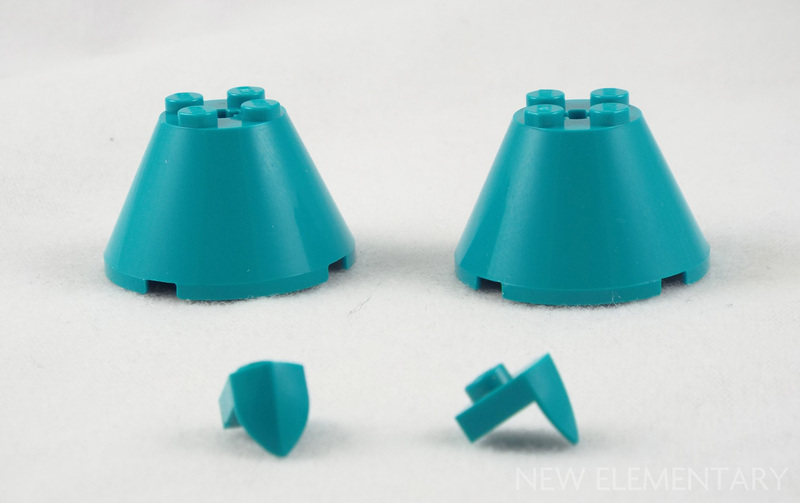 You can definitely expect a resurgence of Teal Bionicle MOCs in the coming year, and with their fantastic colors I suspect 2018's Elves sets are going to be especially popular with the Bionicle fans as well. 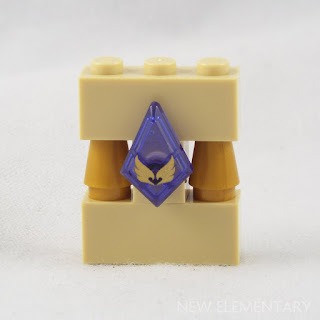 To demonstrate that Bionicle and Elves integrate better than one might expect, let’s take a look at an interesting case study by the builder LEGO7. 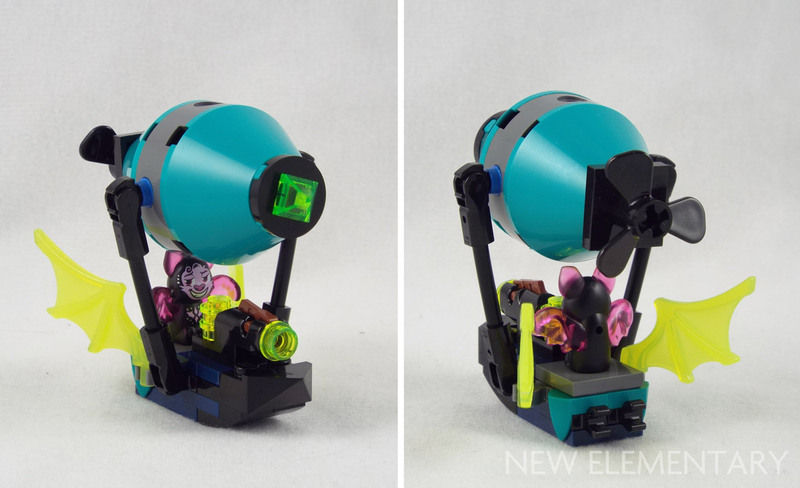 He shows us just how the two unlikely themes can be brought together in this one MOC simply titled Dragon Warrior. One of the things Elves sets provide that Constraction fans are familiar with are the prefabricated heads. Nowadays we see them most commonly used in the LEGO Star Wars Buildable Figure line but LEGO Super Heroes first gave us prefabricated heads, in the Super Hero Ultra Builds. 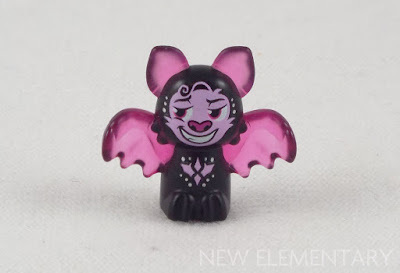 Then Legends of Chima provided very similar heads to the Elves counterparts in their Constraction sets, some even featuring ratcheted jaws like the Elves heads do. 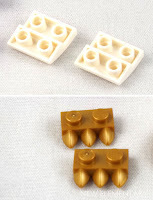 So it isn't much of a stretch for a Constraction fan to use these heads, that a lot of builders might struggle to utilize, in an interesting fashion by simply applying it to a style of build we're already used to. Until recently, Elves had only featured dragons with these style of heads. It is really nice to see them now branch out into other creatures, like a turtle, lion and fox from the other sets in the 2018 wave. I do hope they keep up this trend. When it came time to pick a 2018 set to feature, of the options available I chose set Aira & the Song of the Wind Dragon as when I looked through the inventory of parts I was very impressed with the selection of elements in different colors. There's a handful of new elements in new colors, but a lot of these other elements are new to me! I have to say, as my first ever experience of Elves, I'm really impressed with this set. It was quite an enjoyable building experience and I really like the outcome. The instructions start with building the Wind Dragon. She's a lot smaller than I initially thought, but it doesn't hinder the overall experience because she's quite adorable. One aspect I really like about the prefabricated heads for Elves is that they have plenty of (legal) connection points to utilize as elements on MOCs. This is one of the crucial problems with the LEGO Star Wars heads; they have the connection for the ball joint and usually nothing else. A very welcome addition in this set (and three other Elves 2018 sets) is Slope, Curved 2x2 Inverted in White (Element ID 6210385|Design ID 32803). I've quickly become addicted to these inverted bows in my building as they've made it a lot easier to build the kind of robust builds Bionicle MOCs require of system without a lot of fuss, and they add a smoothness we enjoy too. I suspect builders everywhere will be happy about these. Another new recolor packed into this relatively small build is Plate, Modified 1x2 with 3 Teeth (6207764|15208) in Warm Gold [TLG]/ Pearl Gold [BL], a part which has definitely proved its usefulness over the years. The new Tile, Modified 1x2 Diamond in Transparent Bright Bluish Violet [TLG]/ Trans-Purple [BL] (6213345|35649) isn't quite a tile. 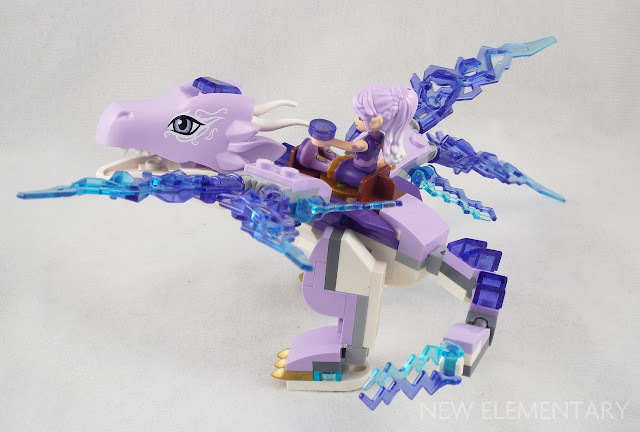 It has a 3.18mm bar on the bottom of it and is attached to the Wind Dragon via one of the recessed studs on her head, supported by a transparent 1x1 Round tile. This is slightly disappointing as it would have made a very nice finishing element, but I also suspect it'd be really difficult to make it sit flush with a lot of things. The use of the bar on the bottom does give it a bit more versatility. It could be applied to a SNOT brick and used as an elegant wall fixture or light housing. 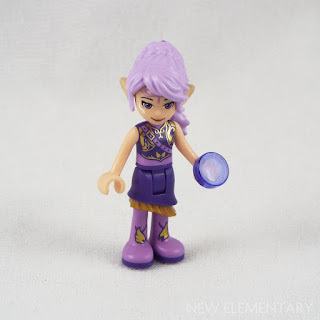 It can also simply be placed in the hands of minifigures. I think if a Constraction builder could get enough of these, they'd make great finisher/detail elements on a MOC. After assembling the minidolls and the dragon, the build moves on to the main affair, Lumia's music shop. This is where the bulk of the set lies, but somewhat surprisingly, this part of the build features the least of the new elements or recolors; those being Flower 1x1 in Light Royal Blue [TLG]/ Bright Light Blue [BL] (6209683|24866) and Plant Plate 1x1 round with Three leaves (6182261|32607) in Bright Green. The flowers and leaves are somewhat superfluous and aren't all that essential to the build. However, the shop was by far the most enjoyable part of the build for me and it was really fascinating to see how color blocking was utilized. I think the color palette and the wide array of elements in different colors is the strength of this set. The slight variations in colors and textures used in the building here really make it for me. I love the use of Medium Nougat [TLG]/ Medium Dark Flesh towards the base, the Brick Yellow [TLG]/ Tan [BL] 1x1 tiles for cornerstones, and the way the roof is constructed using both Medium Lilac and Light Royal Blue [TLG]/ Dark Purple and Bright Light Blue [BL]. Transparent [TLG]/ Trans-Clear [BL] is used to make things “float”, and this set does a lot of floating. My only real complaint about the set is the area where the songbird roosts. These elements are quite fragile and broke off repeatedly during the build process. I wish the instruction designers had sequenced them last in the building process since they aren't totally essential to the rest of the build. The interior which can be seen from the back features a bunch of lovely little details. There's a pipe organ and a banjo for the girls to play. Then up in the rafters there's a small bed for Lumia to take a nap – being a musician is exhausting (I'd know, I play bass and drums). Lumia’s staff features a very interesting recolor that I am ecstatic to have: TLG calls it “Design Element, W/ 3.2 Shaft, No. 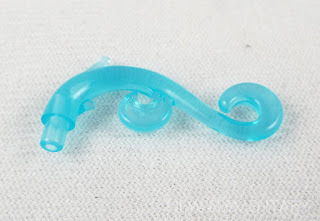 1” and BrickLink calls it “Plant Stem, Curved with 2 Thorns and 2 Swirls”. Personally, I don't like either names but BrickLink's is at least somewhat accurate to what it is. Because I first saw it in Warm Gold [TLG]/ Pearl Gold [BL] on 70612 Green Ninja Mech Dragon, I like to think of it as the “Fancy Filigree” element, as it instantly makes anything look more distinguished and elegant. Now it has been recolored in Transparent Light Blue (6210440|28870 ! This is wonderful as now it can be used for a myriad of things; maybe it's a whoosh of wind, an elemental wielder swirling water about, or a magic spell. The potential for this part in this color is huge. I mentioned the new 1x1 flower earlier; now maybe this is just my Bionicle brain at work but I visualized these more as small decorative gears, so that's what I decided to use them as, along with the Fancy Filigree element to represent water being manipulated by elemental powers. She's a spunky little Ga-Matoran (the water tribe) who has unusually strong control over her element even at a young age, and she loves to play Kholi (a Bionicle sport that's a cross between soccer and hockey). I gotta say I really like using the new 1x1 flower as a finisher element. The recessed stud allowed me to add them onto an impossibly difficult area to cover up: the neck. After this quick little build I'm sold on these parts as gears. 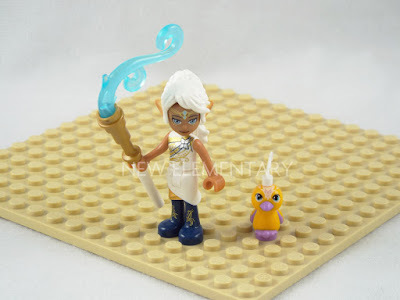 Now I just hope TLG introduces them in neutral and darker colors for us to use in our MOCs. The final stage of the build is Phyll's attack blimp. It is a quick little build and there isn't too much to say about it other than that it is the source of the smattering of Teal that we get in this set, namely Cone 4 x 4 x 2 with Axle Hole (6210594|3943) and Plate, Modified 1 x 1 with Tooth Vertical (6210445|15070). The cone will be useful – I've seen many Bionicle builders utilize that part for shoulders, hips, and flared cuffs at the wrist. The tooth might be a little more challenging but I know we're all up for it. Maybe “Teal-Tooth” is a MOC you could build. Phyll himself is a cute, smug little bugger. He definitely seems pleased with himself. I quite like his wings in Transparent Medium Reddish Violet [TLG]/ Trans-Dark Pink [BL], contrasting against the black body. The printing looks nice as well. I could definitely see him being some kind of shoulder companion to a villain. Maybe akin to Iago from Aladdin, where you just want him to pipe down! 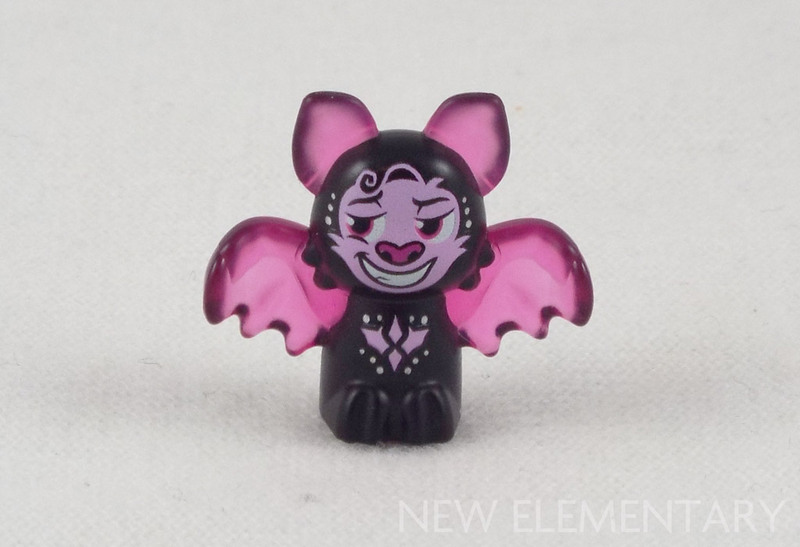 The final element I'd like to discuss is “Minifig, Wing Bat Style”, now in Transparent Fluorescent Green [TLG]/ Trans-Neon Green [BL] (6209982|15082). I have to say I don't really like this recoloring. Certain parts, when recolored in a translucent color, end up looking milky and almost opaque. “Hero Factory Weapon - Blade with Curved top” (Design ID 11305) also has this problem when cast in translucent colors and I generally don't like it in those situations either. Because of the way the part is molded, it suffers from uneven light filtering as well. This is due to TLG designing the part asymmetrically front to back. The webbing of the wing favors one side of the mold; if they went straight in the middle I think this problem would subside. Overall I chose this set because of its plethora of colors and this is its greatest appeal. There are 26 unique colors to this set, although some are only represented by a single part. Building three different models also helps keep things fresh – different types of building, creature creation, architecture and landscaping, and a small vehicle. It definitely gets a strong recommendation from this builder! Color is important to Constraction fans, and I think it's one of the most overlooked aspects of the sets we buy. Bionicle G2, while it brought some great colors back to Constraction fans, was short lived and never had enough time to really push into the corners of the LEGO color palette. Constraction sets currently only come in the form of LEGO Star Wars Buildable Figures and to put it bluntly, it’s pretty rough times when Constraction builders are excited just to get red again. The inclusion of browns and grays were welcomed by Constraction builders at first but after a few years it is starting to wear thin. 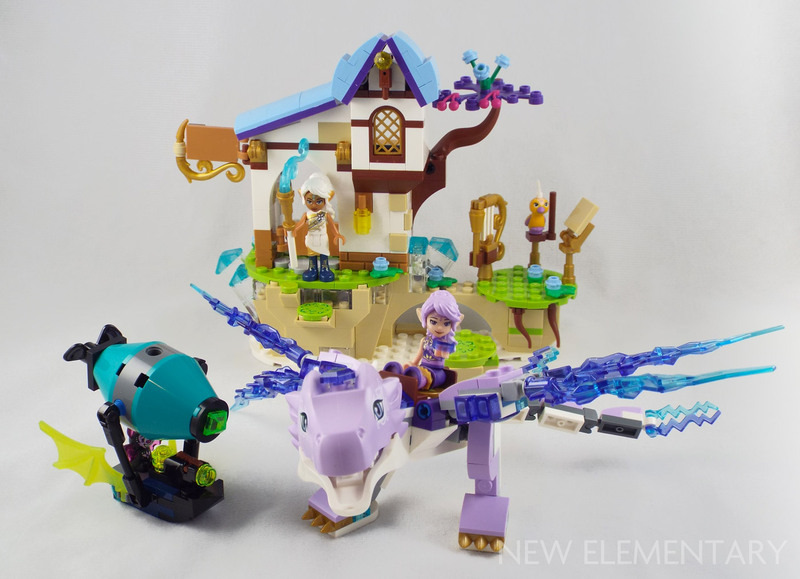 In this color drought, we've now turned to other themes for our bright pretty colors that we were so accustomed to from Bionicle, Hero Factory, and Legends of Chima. Those themes are Elves, Friends, and action sets like Ninjago and LEGO Super Heroes. It makes me wonder though, what would a Constraction theme that utilized more of the pastel colors from Friends and Elves would look like? Could dolls translate into CCBS figures, and would that have any appeal? We may never know the answer to that but it is an interesting thought. I could just imagine how happy builders like myself would be if we actually got pink CCBS shells. I could finally build D.va and her mech from Overwatch. I definitely plan to look more towards these colors in my future building, I hope you do too! Happy building. We want to run more 'parts festival' workshops this year. The LEGO Group help us with the parts, but it is the support from readers like you that helps us to get those parts in the hands of builders. We also want to go to the LEGO Fan Media Days in Denmark so we can bring you exclusive interviews from LEGO employees, but flights and accomodation are expensive. 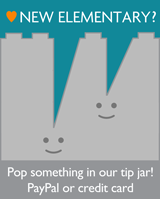 If you like what we do, please consider clicking the tip jar on the right to help us keep going! You can even help us by doing what you perhaps do already - buying from Amazon. 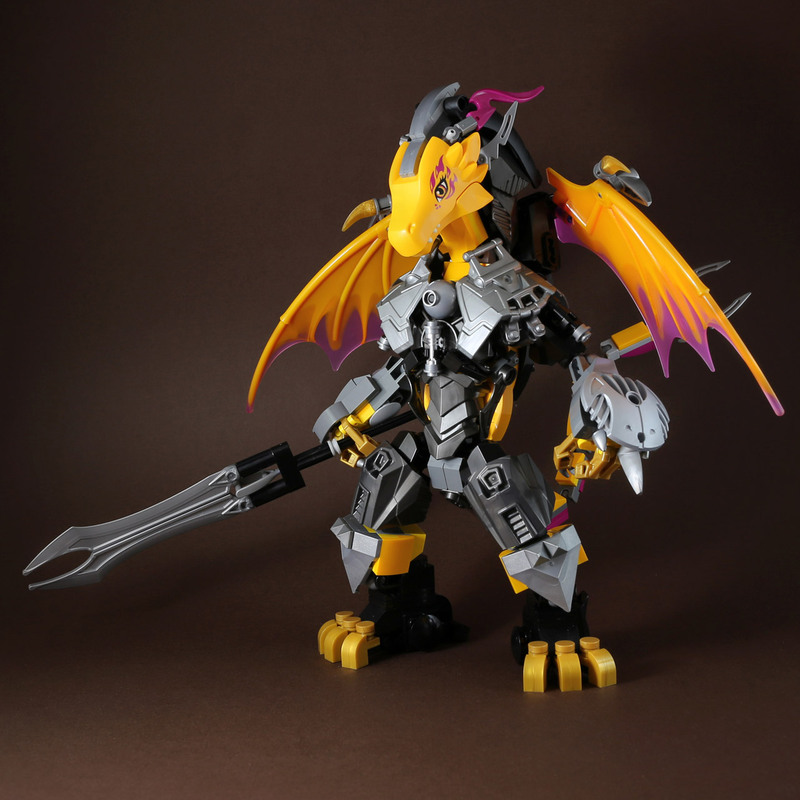 All text and images are © New Elementary except "Dragon Warrior" by LEGO7, used with permission. Good review! As someone else who got into Elves after being a Bionicle fan, it's definitely nice to see someone else who recognizes the shared appeal of the two themes. 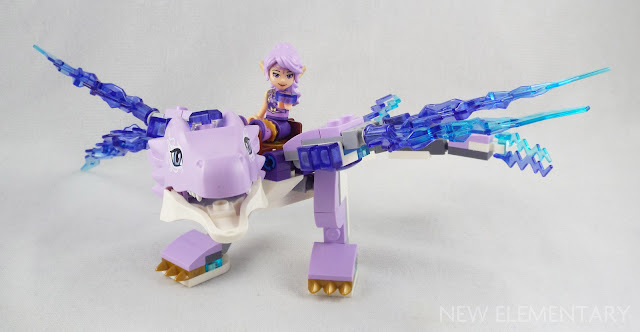 If you liked this I'd definitely recommend some of the older Elves sets with larger creatures, like last year's Goblin King's Evil Dragon which uses Bionicle ball joints for friction in the legs and CCBS beams and shells to attach the two large wings, or (if you can find it) 2016's Queen Dragon's Rescue, which features the largest Elves dragon of all with ball joints similarly used for support and friction in the legs and wings. The new "elemental diamond" parts are nice. If you have multiples, they do tessellate nicely (with a 90° bottom angle and 1.5 module size in either direction when placed at a 45° angle). And while the 3.2mm connection does make them a little trickier to use if you want to use them like you might use ordinary System tiles, it makes them easy to integrate with CCBS armor shells thanks to the shared connection method! Like you, I'd love to see Lego attempt a "constraction" theme for girls, perhaps having a little more in common with fashion dolls (e.g. other brands like Equestria Girls, DC Super Hero Girls, etc.) than the more combat-based Bionicle or Star Wars figures. Of course, I'm not sure whether or not CCBS would be the ideal system for that, or if a different system might be in order. Either way, I think it'd be a great way for Lego to extend the established popularity of themes like Friends and Elves while also breaking into an entirely new segment of the market! Thanks Andrew. I definitely plan on picking up more sets. I've been eyeballing The Goblin King's Dragon cause of those Yellowish Green shells. The fact that Bionicle G2 introduced that color with the Skull spiders makes those shell recolors especially enticing. Yeah that diamond part definitely feels like it has potential if you have enough of them. And I agree using them in CCBS would be incredibly easy. Another reason why I'd actually love to see some kind of mixing of CCBS and this theme. The sets almost design themselves and the Star Wars buildable figures have shown they're more than willing to include the necessary fabric elements to assist with aesthetics. That's True, Lego already has a DC license so they could easily adopt DC Super Hero Girls into a constraction theme. Though would that really generate that many new and interesting recolors? I feel like we'd still get a lot of the same things we saw out of Bionicle G2 as far as color pallets. I think Elves specifically would yield a great result of interesting parts. Lego could also go back to some of the things they tried with Scala, in that they could have figures, and then brickbuilt accessories to go with them so that there's more of a variety of set sizes and styles. The idea is definitely interesting, and I know for certain some FOL's would be over the moon about it. But I fear it all comes down to an issue with Constraction as a whole, the market appeal. Star Wars Buildable Figures is ending after the Solo movie isn't it? The evidence laid before us leads me to conclude that Constraction just isn't viable in the market place. Even though we love them, the mass appeal doesn't seem to be strong enough for Lego to pursue it. I hope I'm wrong though and that we see some kind of Constraction theme from Lego again. I'd be so heartbroken if it went away for good. I was using DC Superhero Girls less as an example of a specific theme Lego could adapt to Constraction and more to sort of highlight comparable products—the dolls produced by Mattel occupy a sort of middle ground between action figures and traditional fashion dolls that I think would work well for an Elves Constraction theme or an original Constraction theme aimed at girls. Ah I gotcha. Yeah that's definitely true. Working for Walmart for the few months I did, I definitely stocked enough of those to get a good look at them. They did seam especially poseable and had plenty of joints, while also still looking like a barbie doll. I can see the middleground approach and I agree with you there. It is a nice balance that'd work for Constraction I think. I feel like on some levels this feels like an unnecessary amount of rationalization. There are a lot of things Bionicle and Elves have in common beyond just colors, like character-driven fantasy in a world built around elemental powers and affinities. But I also feel like Bionicle’s audience is not strictly as “testosterone-fueled” as you claim. Frankly, most of the girls I know in the LEGO community are ones I met through my interest in Bionicle. As in many fandoms, the Bionicle fan fiction scene was largely female-dominated. Many of my friends also implore me to point out how many long-time Bionicle fans and builders turned out to be trans girls. The fact that so much of the marketing was aggressively masculine in its buzzwords and imagery does not in any way mean that the same necessarily applies to the audience it attracted. 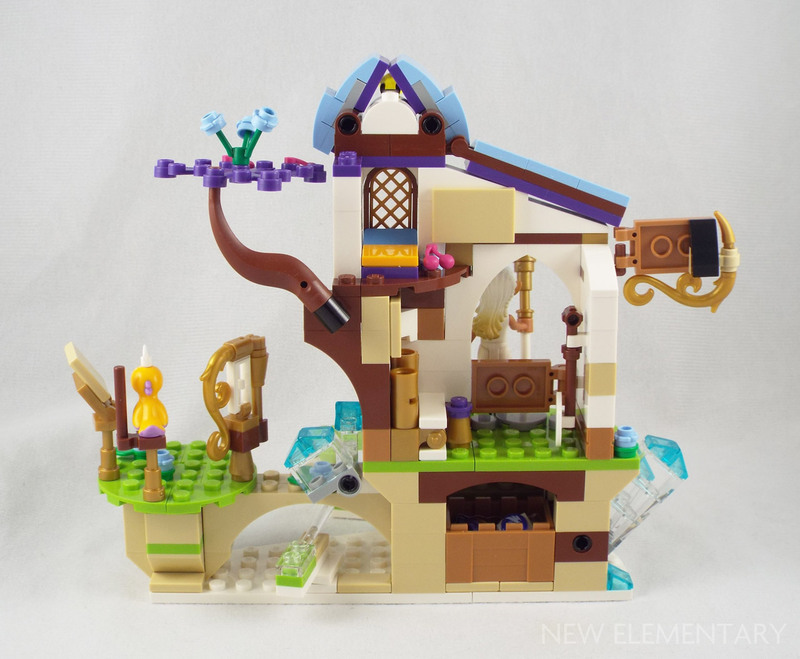 I agree that a more girl-targeted constraction theme, perhaps with elements of the fashion doll category of toys, could be really enticing if LEGO could nail the balance between beauty and playability as well as they have with their System playsets. I would especially love full-size Elves dolls/action figures, given how gorgeous the characters are with more human proportions in things like the Netflix series. One slight correction on story matters — Cyclo the wind guardian is a boy dragon! Also, given its size, I think the bed and the music school as a whole may belong to the bird, Sebastian. 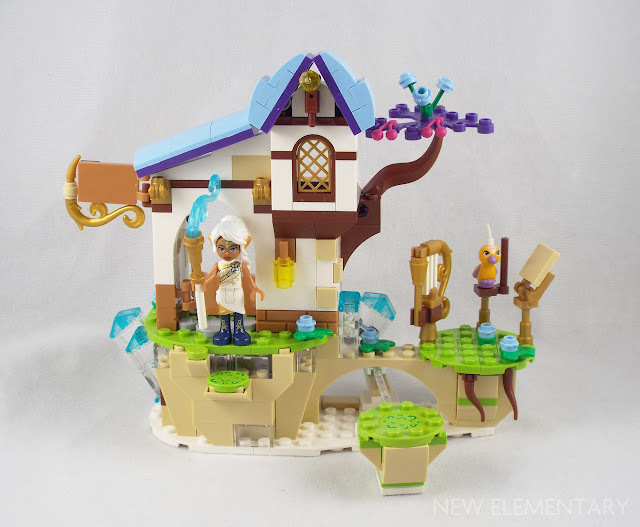 In the webisodes, Lumia calls the Elvenstar Tree home (one of the rumored summer sets), rather than the music school. That's a confirmation bias we both have though. Because the same holds true for me as well. Most of the girls I talk to within the community are fans of Bionicle. But given the disparity of the gender gap in Bionicle/constraction compared to regular system, Bionicle is absolutely a boys world. In the world of MOCing, the amount of active female builders is quite low. I also don't consider the more lore and fanfic side of the community because I'm speaking strictly from the perspective of a MOCer speaking to other parts enthusiasts who are most likely also fellow MOCers. I haven't followed any of the Elves story lore. This is my very first foray into Elves as a theme all together. So I think it's a little unfair to expect story comparisons of someone unfamiliar with Elve's as a whole theme, and is exploring it for the first time. All my parallels were drawn from the expertise and experience I have, which is as a MOCer, which is why I wrote an article for a blog that focuses on lego parts and their MOCing potential. If you ask me, the story implications aren't really relevant to this article or this venue. I don't know what percentages you're experiencing in the Bionicle fan community, but FFOLs can be fairly rare in general. I'm not sure there's any one theme that _isn't_ dominated by male AFOLs. I recognize that Elves has proven to be more than just Fantasy Friends, but I still don't care for it, largely because the minidoll design is terrible. I also never liked the shift towards the CCBS system, where it feels like all you're doing is cladding a predesigned model rather than constructing a true MOC. Ironically, where you say that the Constraction crowd is "one of the most testosterone-fueled niches", I've moved on from Bionicle to cars and superheroes, with a touch of 80's pop culture. I'm not the biggest fan of the Mini-doll design myself. But this is also coming from someone who's simply not a fan of minifigs in general. However, like the Minifig, I understand its appeal. It has more detail and slightly more realistic proportions. I do think it was a clever move though making the heads comply to minifigs so that you can use their hair pieces. It creates for some if nothing else, amusing wig swaps. LOL The dolls weren't really the appeal for me. The recolored parts are what captivates us Bionicle fans most I think. And like Aanchir said, there's cross appeal in terms of the lore as well, though I'm taking his word for that since I know almost none of the lore for Elves. As for CCBS. It can be quite a lot more than that, it just takes some readjusting of the MOCing mindset to really get CCBS to not look set standard. And its best used when blended with other systems. But then again, so is every other system in Lego. Regular system by itself while it offers a lot of solutions, doesn't offer all of them. https://flic.kr/p/23g7TKx this is a recently revamped MOC of mine, and it was my first real attempt at working with CCBS, and it still has a lot of CCBS to it. I thought that the writers and the MOCs shown were supposed to showcase the new parts/recolors in the set? A Bionicle robot with system tacked onto it holding a piece doesn't really seem like a showcase to me. I really hope this isn't indicative of a slip in quality for this blog. The minidoll torso is a powerful studless 3.18 mm adapter element that's been completely overlooked. As a character builder I find the dragon head shape useful but it's painted in an impractical rare color. I've had quite a bit of trouble using the trans colors in character building also so all the purple stuff here is impractical too. Constraction fans always go on about how they want the rare one off colors back but I don't understand the need. The few molds that existed in dark turquoise are impractical and useless for most character building situations unless you buy piles of the same shape over and over. Good review Dave but I think I'll pass on this one. Fair enough. I'm just glad you liked the review. Everyone has different styles of building. Someone like Eero Okkonen has used plenty of system parts blended with Constraction for some really stellar character builds, I can see someone like him using the cones on a build. I tend to blend system into my figures to. Its just a matter of preference in what parts you like to use. You love using helmets and boat studs(Boat studs are so useful <3), and I can honestly say I've never used a helmet piece before.